Caroline Pugliesi, sales executive for a software firm, commutes from her North End home to South Boston. When Jeremy Debate searched for a new job three years ago, he wanted the work to pay well, be exciting, and advance his career as a software engineer. The 27-year-old had one more condition that was not negotiable: The job had to be in the city; none of those long commutes to an isolated office park in the suburbs. 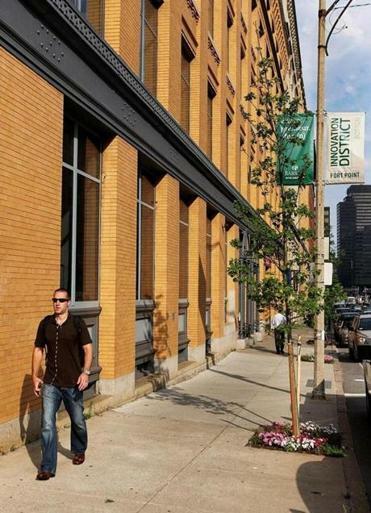 The Fort Point district in South Boston has attracted new businesses into the area. Debate is now taking the MBTA every day to his job as a software engineer for Apperian, a technology start-up on Summer Street in trendy Fort Point Channel. Young workers like Debate are driving a mini-migration of companies from the suburbs into city neighborhoods that have convenient public transit, a lively restaurant and bar scene, and other features of an active urban life, commercial real estate specialists said. In some ways, local companies are merely following a broader trend sweeping the country, as many downtown sections of US cities have been revitalized and are attracting empty nesters and families who want the energy of a more compact, busy surrounding. But tech companies in particular, as well as other businesses in so-called “creative” fields such as advertising and marketing, are also courting younger workers who don’t want much separation between their work life time and personal time. So if they live in or near the city, the office had better be nearby, many corporate executives have come to realize. Fort Point’s renovated warehouses beckoned another suburban dweller, LogMeIn Inc., which will soon open new offices near Apperian on Summer Street. Rent is about 25 percent higher there than at its current location in Woburn’s Unicorn Park, but the company, which makes products for remote computer access, feels the move is necessary in for recruiting and retaining employees. “I would say it’s the sole strategic reason for us moving to Boston,” said chief financial officer Jim Kelliher. The 52-year-old Kelliher has been around in the tech start-up world long enough to remember when the trend was in the opposite direction — to the outer ring around Boston — where the tech giants of the time, Digital Equipment Corp., and Wang Laboratories were based. And not just any old city office building will do. Younger workers want their workspaces to have the exposed brick and beams usually found in industrial buildings in old urban districts. Other tech or media-related firms that have recently moved to Boston or Cambridge, or are planning to, include Isobar from Watertown, and RAMP, which decamped Woburn for Fort Point. And some firms in Cambridge’s crowded Kendall Square, are choosing to move to Boston rather than take less expensive space in nearby suburbs, according to real estate firm CBRE/New England. Another Apperian employee, Caroline Pugliesi, used to work in the suburbs — Woburn — but so longed for the convenience of urban life that for her next job she didn’t consider a new employer outside the city. 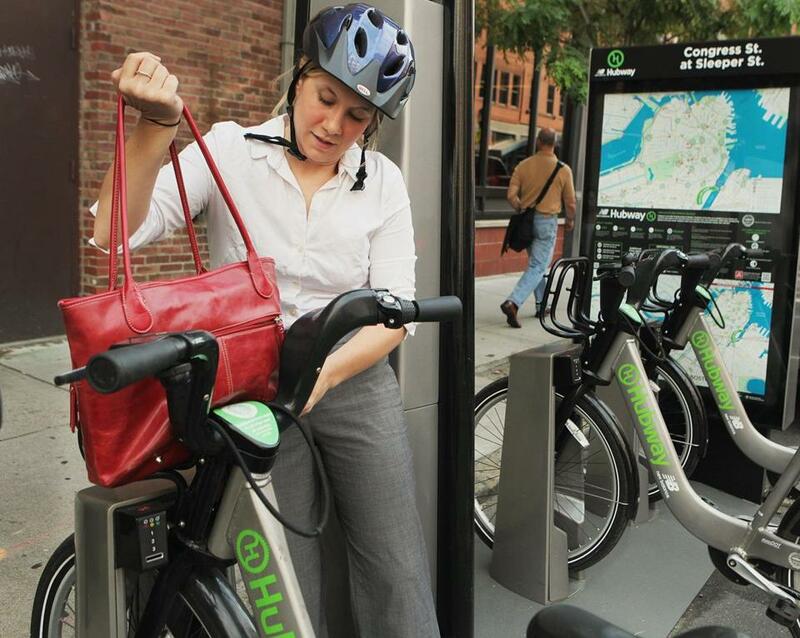 Now she happily bikes to work many days from her North End apartment. “It gives me anxiety just thinking about moving back to the suburbs for work,” Pugliesi said. Another urban worker, Nikki Festa, worked in public relations in the South End but had harbored a desire to work for one of the bigger firms in her industry, PAN Communications, but for one catch: PAN was in Andover. That would have made for a long commute from her home in Winthrop. “I just wasn’t interested,” Festa said. But then last year PAN moved to 225 State St., near the new Greenway parks in Boston — and suddenly the company was more attractive; Festa ended up getting a job there soon after it announced the move to Boston. PAN president Philip A. Nardone said not only employees, but clients too wanted the company to be in the city. The trend helps to explain why office markets in Boston and Cambridge are doing so well, while portions of the suburbs struggle with high vacancies. Despite an improving economy, the amount of available office space around Route 495 area is even higher this year than last — above 30 percent; in Boston’s Seaport District available office space is down sharply, to 22.1 percent. Meanwhile in-between, in the central Route 128 market, the real-estate picture has improved, with office vacancies also falling. But some of the new tenants are companies relocating from farther out west, such as Avid Technology Inc., which moved from Tewksbury to Burlington, Boyle said. Some owners of suburban office parks owners aren’t sitting back. Nordblom Co., which is redeveloping the giant Northwest Park office campus in Burlington, is attempting to create a “more urban environment” precisely to keep and attract companies tempted to move closer to the city and its array of amenities, said Todd Fremont-Smith, managing director of development. Yet the suburbans will be a nonstarter for many younger workers whose presence has helped make urban business districts such as Fort Point so busy. “When we first started, it was almost lonely here,” Patrick, the Apperian chief executive, said of the company’s offices at the Summer Street building.